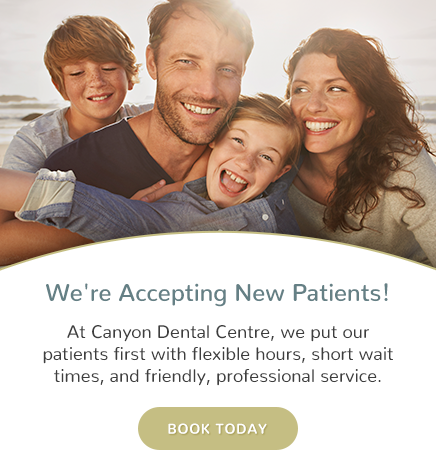 Interested in visiting Canyon Dental Centre? Your first visit to our dentist office? Learn more about what to expect, and how the process works. Canyon Dental Centre in North Vancouver is always accepting new patients. Visit our office in North Vancouver today! Learn more about our office and how to book your first appointment. We are dedicated to providing professional, personalized care, and we're available to offer our assistance and answer any questions you may have. You can reach us during regular office hours to speak with a member of our team or to schedule an appointment. Your scheduled appointment time has been reserved specifically for you. We request 48 hours business notice if you need to cancel your appointment to avoid being charged an additional fee. At your request, your treatment will include a breakdown of all applicable fees, and we will inform you of all costs before treatment is administered. Charges are payable at the time of treatment by Debit Card, Visa, Mastercard, Cheque or Cash. Please ask a member of our staff and we will review your payment options to accommodate your financial needs.